NOTE Nov-2014: We have heard from a couple of subscribers that Threaded Canvas have not delivered their boxes at all and we ourselves have tried countless times to get in touch with them to no avail as the box they were going to send us for review never arrived. Please do leave a comment if you’ve had an experience with this company. Rather than take this box off the site, we’ve decided to leave it here as a warning in case any of our readers are interested in knowing more about them. Threaded Canvas was started by a group of art lovers from Indiana with the goal of giving the gift of art to a larger audience around the world. We began to brainstorm ways to celebrate creativity in new and inventive ways. Thus, Threaded Canvas was born and so was our mantra: Celebrate Creativity. 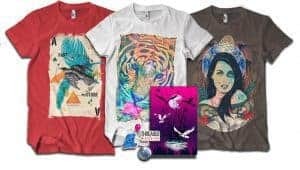 We decided that t-shirts were the best medium to spread amazing yet affordable art around the world. Each month we include three art tees, one art print, and three small art collectibles. Monthly subscription: $20 per month. Shipping to the UK is currently $15 and shipping to the rest of the world is $20. How would you rate Threaded Canvas ?